On designing new cards, nerfing Dr. Boom, taming Rexxar, and easing in new players. Hearthstone's game director Eric Dodds is in London this week to attend the BAFTA awards ceremony, where the game is in contention for a total of three prizes. We had the opportunity to speak with him at Rezzed - the PC and Indie gaming event run by MetaBomb's parent company Gamer Network - about the current state of Hearthstone as we approach the release of the Blackrock Mountain Adventure. Read on to find out how the team goes about designing new cards, selecting Adventures, and whether Dr. Boom and the Hunter Hero deserve a swing of the nerf-bat. If you were hoping for a nostalgic trip back to Karazhan before last week's Blackrock Mountain announcement...well, we might just have some good news for you on that front too. MB: What's the process for selecting a new Adventure. Why Blackrock Mountain? ED: That's a great question, and certainly there were tonnes of great suggestions from the community. We're all huge fans of Warcraft, and when we got around to choosing this we just wrote tonnes of different ideas up on our whiteboard, then started talking about each one and why we were excited about it. There were a few things that worked out really well for Blackrock Mountain. One was that we liked the change in environment. Naxxramas is about cold and ice and the undead, and Goblins vs Gnomes is whacky mechanical stuff. This had a very different feel to it, and we like continually changing things out. Another thing is that it was recently the ten year anniversary of World of Warcraft - and of course Molten Core - and so it seemed like a great opportunity to dive in there. We were also really excited about exploring the Dragon thing, and it seemed like Blackrock Mountain would work very well with the idea of Dragons. MB: On the subject of Dragons, do you think Azure Drake is going to end up being the next card to be nerfed? ED: The funny thing is that our goal is actually not to nerf cards. Of course we're not always successful there, but we don't currently have any cards on our watch-list. For us to nerf a card, it actually requires us to feel like it's affecting the metagame in such a large way that it's reducing the number of decks. For instance, we recently changed Undertaker because when you're playing the game you're running into way too many of the same specific type of deck. To jump to a question you will no doubt ask later, we can talk about Dr. Boom. Dr. Boom is certainly a card that a number of people have in their decks, but you certainly don't see it in all of the decks when you're looking at the highest level. MB: And it's why you pack a Big Game Hunter? ED: Yeah, and even if it were in all the decks - which it isn't - the diversity of decks you see it in is still pretty broad. It's not really affecting things so you see the same thing over and over. There's still a tonne of different ways of making it fit. MB: So Dr. Boom is definitely not on the nerf list? ED: Absolutely not, but our more general philosophy is we're not really excited about changing anything. We don't want to change anything, and the only reason we'd change something is if we felt like this was really negatively impacting the overall experience for our players. MB: Just to come back to Blackrock Mountain for a moment, was Karazhan ever on the table? It's a very popular dungeon, and the chatter before last week's announcement was that it would be the next Adventure. ED: We certainly talked a lot about Karazhan, and I would be surprised if we didn't do it at some point in the future. It just felt like for all those other reasons, Blackrock Mountain was a better fit for this moment. Certainly I can tell you personally...I can't even tell you how many hours I've spent running through Karazhan. It's certainly a Warcraft dungeon that I love. MB: When you design new cards, to what degree are you led by a desire to balance or shore up an area of the current game you feel is lacking, versus creating cool new stuff? How do those two demands on your attention balance out? ED: We normally have a big theme that we're excited about exploring, for instance the Dragon theme [of Blackrock Mountain]. But whenever we're putting out a new set, you'll certainly see some cards that are tactical. If this type of deck is strong, here's a useful card to put in your deck. We're always making sure we're putting more cards of that type into the set. Certainly some of those cards would be to potentially address an existing problem. Actually, the players have been pretty creative as far as solving these problems on their own goes. Mostly we just want to make sure there's a wide variety of solutions out there, so that whatever the situation that comes up - and we certainly will be the first to say we can't predict the next crazy deck that players come up with - there'll be something that's an interesting counter towards that strategy. We have our main theme, and our main theme is usually not directly related to what the metagame looks like. Then we have these little sub-theme, one-off cards. Some of them will be related to an existing metagame issue, some of them will just be relevant for a future metagame issue. Hungry Crab is a great example - people are not currently concerned about being destroyed by Murloc decks, but if they ever were then it's sitting right there. ED: [Laughs] That was never something we have talked about before, but now that you put it in my brain I'm going to have to think about it going forward. MB: How do you actually go about designing the cards though? Does it start with a really cool idea that's then balanced through resource pools? Do you assign a certain value for a certain kind of Battlecry, and that's deducted from the pool? ED: It actually always starts with the idea, but we have two sides of things. There's design and there's development. When cards are being designed, we don't worry about the numbers very much. We just think that something would be awesome. We do think about it a little, because there are some ideas that are not even balanceable - you couldn't change the numbers to make it balanced. For the most part though, we just look at what would be a super fun idea, or a super interesting idea, and then we hand it over to our balance team and say "OK, put some numbers on this that are actually reasonable and appropriate for the card." Certainly we don't have a matrix where we say a two Mana card can have this number and that number, and one minor factor. It's all done first by the gut instinct of the designers, then our balance designers play it a tonne before it goes out in the world, to make sure those numbers are right. All of those guys on our balance team are high-level Legend players. They're all extremely talented, so we have a lot of faith they're going to be able to find things that are broken, and make sure they get nipped in the bud. MB: Everyone agrees botting is bad, but what can you do to stop things like Elie Bursztein's machine learning tool? If it's an inevitability that someone will replicate that and release the tool, what can you do to counter that? ED: That is a great question and it's a very interesting question and I think that we don't have all of the answers right now. Certainly we feel very strongly that Hearthstone should be a game played by humans, and so we take very seriously anybody coming in and trying to run a bot, and not actually play the game. Exactly where the future of machine learning is going to go, I think it's going to have a lot of interesting implications - not just for Hearthstone, but a lot of other areas of the world as well. I think that's a larger philosophical question I have difficulty answering, other than to say that Hearthstone is a game to be played by people. MB: Is there ever a time in the office - thinking of the recent Undertaker issue - where you know the answer to a problem is out there, and you kind of have to bite your tongue while you wait for the community to work it out? ED: We've certainly had times - I don't know about recently - I know months ago we had times where the balance designers would say "Great, they've discovered this, but we have a slightly better version that we think internally plays better". They'll discover it in a couple of weeks, and that has happened once or twice, but in large part the players discover things so quickly, and are so smart at figuring stuff out that it doesn't happen all that often. ED: The last few weeks I still feel like we've seen a few new deck types that have been drifting into the very top level of play. As those drift in, the meta shifts as well. Oil Rogue is a reasonably new one, and there's a lot of interesting deck types. If those gain predominance, then of course the metagame will shift, and other deck types will come in because they play better against it. MB: One issue with the meta at the moment is the aggro Hunter. I've played it a lot myself and I've played against it a lot, and there are interactivity issues with it. Often you depend on the Hunter having a bad starting hand to have a chance of winning. Have you considered redesigning the Hunter in any fundamental way - is the Hero Power fundamentally a problem with its cost and effect? ED: I don't think we are likely to redesign the Hunter Hero Power anytime soon. It's certainly not something we've talked about. I think it's an interesting class, and there are definitely cards that have been put into the environment to see if they can affect that tempo play. The Healbot from Goblins vs Gnomes, for example, that heals you for eight was a card put in there as an option if you're getting over-run by someone not going for board control. It's certainly something we talk about, but we don't have plans right now to adjust the Hunter. We feel like there are a lot of other tuning knobs that we have to affect all of the different classes. I still say that at the highest level, there are multiple classes that are still quite effective at this time. 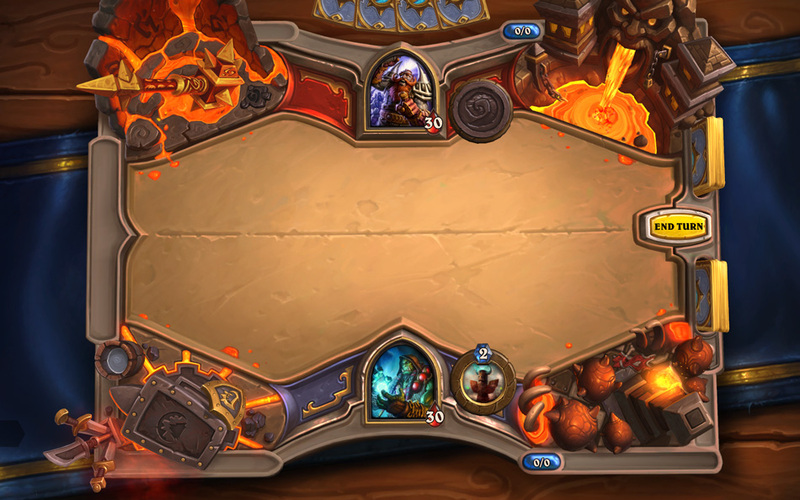 MB: We've got the iPhone version of Hearthstone coming out in the next few months. Are you working on a console version of the game, or exploring it? ED: It's a fun idea, but it's not something that we're working on right now. We're putting all of our effort into new content like Blackrock Mountain, and getting the iPhone and Android phone versions out. There's a lot of work required to get those out, and it's also important to realise that it's actually only been a year since we released the game. Yesterday was the one year anniversary, and in that time we've released an Adventure, an expansion, on tablets and soon on phones. The tournament scene has been blowing up, and we've been tracking all that - there's been a lot going on. Is it possible that we'll talk about consoles in the future? It certainly is possible, but right now it's not something we've been discussing. MB: You'd expect an explosion of new accounts when the iPhone version comes out. When I introduce people to the game now, with cards from Naxxramas which seem essential, I feel like it's becoming a $50 game with further micro-transactions. Are you doing anything to ease the new players in, to make it a little more welcoming? ED: Certainly we're always talking about what that flow is, and we've definitely made changes to our new players flow coming into the tutorial for the phone version. It's very important that you understand the game when you first enter it. As far as the metagame and the cards required, I don't feel like - at least at this point - that it's required to have all of those cards. I can say personally that I do a lot of playing with just cards that are from the Basic and Expert sets, and I still feel like I can be very successful with those cards. Really, what you're pointing out is a problem that's going to become a larger problem over time, as more cards are introduced into the environment. That's definitely something we're spending a lot of time talking about. We don't have a statement about what we're doing yet, but it's definitely important to us, and it's something we feel will be important to solve. We're just not quite at that tipping point yet. I really don't understand these complaints about needing to pay-to-win. I can truly say I've not spend a penny on the game. Payed for Naxx with quest gold, and yet I'm currently rank 4 in the ladder. My Tempo Mage deck has 4 legendaries. 1 from Naxx, 3 I've crafted from disenchanting other cards. I'm a casual player, I average out at 3-4 arena wins per run. All I'm trying to say: it's no pay-to-win, just a great game! @paytowin Are you slow in the head? its a card game, like all other card games its pay to win but you can craft the cards you want if you're dedicated within a month or two without spending money, if you can live with only having 1-2 functional decks. Hi all. I have been playing since early beta. I have got 820 wins in arena and 1300 ladder wins. And here I am, still cant reach some key-cards(some of them not even legendary) for some decks. I feel like it won't be a false if i say i covere 65-70% of All daily quests. That is my story. when will the free to play version of this game be released? omg why does dr. boom always laugh at my war golem? balance! @Niode I can agree with that. I'm a pretty average player. Been playing for about a year, so I have a good selection of cards. But even with that I spend the first half of every month playing the Arena to avoid the carnage in ladder mode. I know the people I'm playing are only a few ranks above me, but I still get wiped out. Anyway, interesting interview with Dodds, always nice to get an insight into their process. I still can't believe that increasing the power level of some underused cards has not even been considered. Somebody must be thinking about it at Blizzard. They have all these stats on cards that are played and there are cards out there that are simply unplayable. It's very difficult to get above a 30-40% win rate with just basic cards in Hearthstone, especially in the ladder and that's coming from an experienced player. It's nigh on impossible for a new player to be successful without putting in a lot of money into the game. I have been extremely blessed in the fact that I've never put any money into the game apart from Naxx and have a very large pool of cards including all the relevant legendaries (except Sylvanas, annoyingly). That's come from playing solidly since beta. New players simply don't have that as an option. Given the high number of players Hearthstone experiences on a day to day basis perhaps a diversification of the play modes is required. Such as the way that MTGO does it with Pauper tournaments etc. Even some form of match making that matches players with access to similar card pools with each other. They could simply have a score for your card library which calculates your overall card value (some cards are simply better than others on an intrinsic value level despite being the same cost/rarity) and then match players in a similar range. Then the whales can play with other whales and lucky bastards like me without beating down on the new guys.